Closed captioning has been a part of television broadcasting for several decades. For pre-recorded shows, the captions can be added in a studio, carefully typed, proofed, and formatted. In the U.S., this is known as “offline” captioning. For a live show, someone has to type that text as it is spoken, known as “online” or “realtime” captioning. It is traditionally been performed using a stenotype keyboard like court reporters use, and the person typing at breakneck speeds of over 200 wpm is called a stenocaptioner (this is what my wife, Kathy, does for a living). Realtime captioning technology was first used on a live broadcast during the Academy Awards in 1982, performed by my friend Martin Block. A decade later, it still hadn’t found its way into cyberspace, except in limited private chats. The company my wife and I started (Cheetah Systems) had been playing with the concept of streaming realtime text, but hadn’t had a chance to use it online. The following is an excerpt from my first book (The Court Reporter’s Guide to Cyberspace), with a wee bit of editing to bring it up-to-date and change the writing to first person. The big unveiling of realtime into cyberspace occurred in November of 1994. California State Senator Barbara Boxer set up a conference in Washington, D.C., for California business leaders. One of the guests was Vice President Al Gore, speaking on the subject of “Building the Information Superhighway.” When I saw the Vice President’s name on my conference invitation, it seemed like the ideal opportunity to use this technology. At the time, there were some issues with fast text streaming on the Internet, but CompuServe had chat forums that were working well for the purpose. I called Vice President Gore’s office and suggested live streaming of the speech. 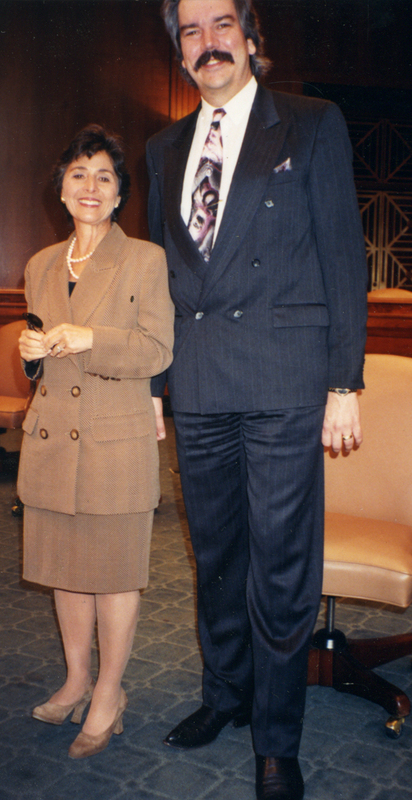 Barbara Boxer is not a large woman. At 6’5″ tall, I ended up looking like the Jolly Green Giant in this photo with her. At first, the Vice President’s office resisted the idea of realtiming the speech onto CompuServe. They felt that if it wasn’t being broadcast on television or radio, it shouldn’t be broadcast on CompuServe, either. In actuality, politicians speaking to special interest groups rarely want their words shared with general audiences. Eventually, though, both Senator Boxer and Vice President Gore agreed to have their speeches realtimed. Realtime reporter Jack Boenau from Sarasota, Florida, agreed to handle the realtiming. He and I flew to Washington. Richard Sherman (my co-author of The Court Reporter’s Guide to Cyberspace) reserved a virtual conference room in CompuServe’s “CRForum” (the forum for court reporters and captioners). 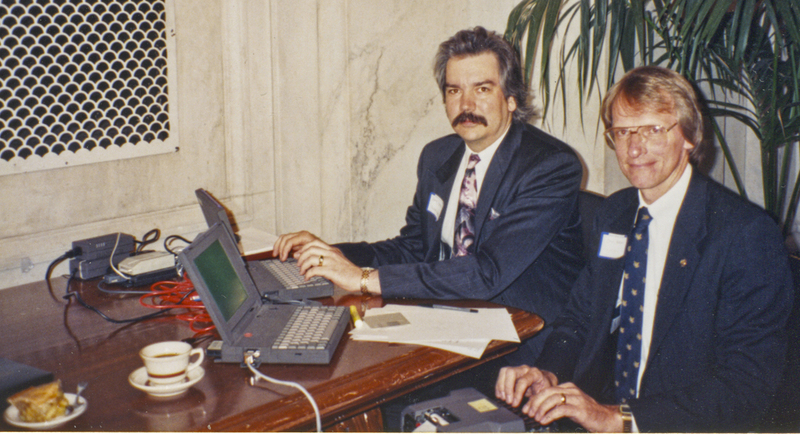 On the morning of the speech, Jack Boenau and I were present at the Russell Building in Washington, D.C., and the world was at their computers and logged into CRForum’s Conference Room 2, renamed “V.P. Gore Conference” for this historic event. Everybody anxiously awaited the scheduled 12 noon, EST, commencement. At the last minute, we found that we couldn’t get a modem to connect using an outside line from the Russell Building because all of the building’s phone systems were digital. I ended up — much to the dismay of the Vice President’s security detail — stringing my modem lines behind the stage to be used by Senator Boxer and V.P. Gore, and into a little phone booth in the kitchen. I had to take apart the phone booth and jack in to the phone. The Senate techs weren’t overly enthused about my ad-hoc phone phreaking, either. Once the hookup was complete, Jack provided entertaining and informative narration to online participants, describing the scene in Washington, the security clearances, the snarling dogs trained to lunge for the jugular at the sound of an unfolding tripod. I had an interesting encounter with one of the bomb-sniffing dogs, but I’ll save that story for another time. SENATOR BOXER: One thing I wanted to mention to you, which is terrific, today’s speech by Vice President Al Gore is about building the information superhighway, but the Vice President isn’t just talking, however. The speech, part of the seminar put on by yours truly, is being transmitted live onto CompuServe, one of the information services that make up the prototypical information superhighway. So as we sit here right now, because of these terrific people, with about a two-minute lag, they will be receiving the speech. Oh, I’m sorry, a two-second interval. They will be receiving the speech. See, I have to catch up. You’re so far ahead. The changes that are now underway within our society and within our civilization as a result of new information technologies is very difficult to overstate. These changes are of the same order of magnitude as those changes which accompanied the invention of the printing press, except that these changes will not be strung out over centuries. Instead, the impact will be telescoped into only a few years. Jack Boenau (on the right) and I hoping that our power suits and 90s haircuts will keep that cutting-edge technology working. The tea and apple pie was to keep us working. From around the country and the world, reporters and lay persons witnessed a remarkable event. Sitting thousands of miles away, everyone could participate in an event otherwise accessible only by those in attendance. Those online could watch the words of the Vice President scroll across computer monitors, and although no questions were entertained from the general public during this session, individuals sitting at computer keyboards had the capability to ask questions, offer input, or cast votes in an election situation, if permitted to do so. Everything worked beautifully and an entirely new arena opened up for realtime reporters through the melding of two technologies: online communications technology and this latest breakthrough in reporting technology. Today, this kind of event is taken for granted. In 1994, it was groundbreaking. In fact, it became the backbone of an Internet broadcasting company (Cheetah Broadcasting) that my brother and I ran for several years, performing live transcription of events onto CompuServe, America Online, Internet chat rooms, and eventually dedicated web applications. Posted on 1 June 2013, in Blog and tagged Al Gore, America Online, Barbara Boxer, Cheetah International, Cheetah Systems, closed captioning, CompuServe, CRForum, Gary Robson, information superhighway, Internet captioning, Jack Boenau, Kathy Robson, phreaking, realtime captioning, realtime text, Richard Sherman, Senator Boxer, stenotype, streaming realtime, The Court Reporter's Guide to Cyberspace, Vice President Gore. Bookmark the permalink. 5 Comments. Gary – Great Software! My wife was a court reporter for many years and we were going through some of her old stuff – in particular, the Epson NB-SL 386 laptop with a MASSIVE 80 Megabyte hard drive! She still had her activation dongle that plugged in to her parallel port (SN 3042). Brings back many memories, especially the User Groups where your company actually LISTENED to the court reporters. Thanks for continuing on your dream. Thank you, Steve. I just took a look at your post. Well said! I have trouble watching TV without captioning anymore, and I’ve thought about the points you made. Great read, Gary! Thanks for sharing … and I love the photos, too. Pioneers like you and Jack and so many others have paved the “reporter highway” for so many — and we’re grateful! Thanks, Melanie! Some of those events were a lot of fun. Some were pretty high-stress. Taking apart a payphone to string cables across the VP’s dais right before an event — under the watchful eyes of the Secret Service, of course — was one of the high-stress ones!